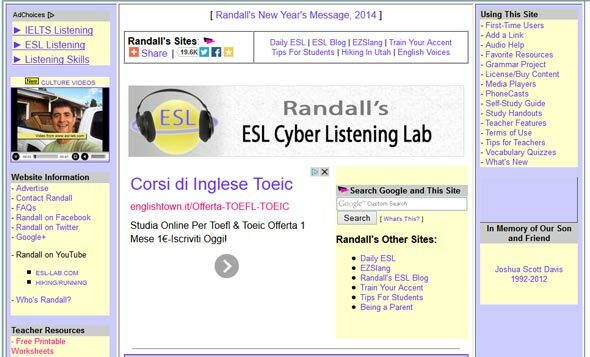 Randall's ESL Cyber Listening Lab is one of the best-known ESL student resources on the web, and one of the best for students who want to improve their listening skills. If you're new to the site there is a user guide along with videos to show you how everything works. There is a useful index in the self-study guide which helps you to search for listening activities based on topics. On the main index page you will find listening activities in handy categories including General Listening Quizzes, Basic Listening Quizzes, Listening Quizzes for Academic Purposes, 20-Minute ESL Vocabulary Lessons and others, which is great if you don't want to spend all day searching lists! Each listening activity on esl-lab.com has a variety of related vocabulary quizzes to help you review and improve your listening and speaking skills.